So you’ve heard of Google Analytics, but you don’t really understand what it is, or how it works? Google Analytics is a free tool that lets you monitor and analyse website traffic. It is the most widely used website statistics service globally (In 2009, 50% of websites contained some kind of traffic analysis tool. Of that 50%, 80% were using Google Analytics). A website owner adds this code to every page of their website that they would like to track. 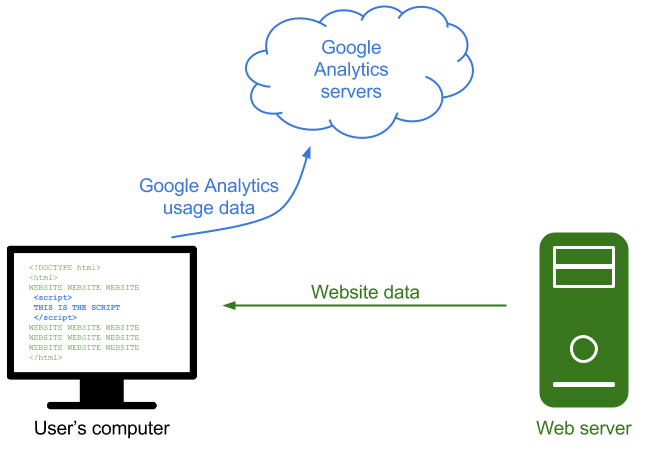 The usage data is then stored in Google’s data collection server. How can I tell if a website is using Google Analytics? As mentioned above Google Analytics is included via a page tag. You can view the source code of any webpage on the World Wide Web using your browser. Once you are looking at the source code of a webpage, you can check for the Google Analytics code. If you find “analytics.js” or “ga.js” or “googletagmanager.com” in the source code, the webpage is tracking usage with Google Analytics*. Can I view the analytics for the website? Access to the analytics being collected for any particular website is limited to those who have login access to the Google Analytics account. If you are an employee of an organisation, and want access to your own organisation’s analytics, you can try asking your IT department (or whomever looks after your analytics) to grant you access. If they want to grant you access, it is an easy job. a whole lot of stuff that no one has thought of yet. While you cannot collect personally identifiable data in Google Analytics, you can assign IDs (perhaps a customer ID) to multiple sessions across multiple devices. In turn, this new Google Analytics data can then be exported and correlated back to existing customer/client data outside of Google Analytics. For a deeper explanation of all of this stuff, check out Justin Cutroni’s Understanding Cross Device Measurement and the User-ID. How can I stop Google Analytics collecting data about my activity? The first two options will affect your online experience (some features or functionality may not work). How can I start tracking users on my website? Matt works at Heyday in Wellington, New Zealand. If you like what you just read, please hit the ‘Recommend’ button below.